Casper was a friendly ghost. In the mattress industry, Casper is the brand that wants to kill. They want to kill the bad experience. Murder the margins. Bury the slimy sales guy. Cut out car trips. And put industry charlatans under the blade of a glistening guillotine. Doesn’t sound too friendly to me. But this was inevitable. Smart, tech-savvy entrepreneurs are salivating over stagnant industries that need a new cop on the force to shake things up. The mattress industry is ripe. Casper and Tuft & Needle are sleep startups making headlines with their sleek approach to mattress buying. They’re replacing smoke and mirrors with elegance and transparency. Instead of following a traditional retail model, these online-only retailers offer simplification. Casper sells one mattress in several sizes. Tuft & Needle carries two – a five-inch and 10-inch. As you know, comfort matters, but too many choices is the same as no choice. It creates analysis paralysis. Instead of asking customers what they want, Casper and Tuft & Needle tell people what they’re selling and why it’ll likely fit their needs. Limit their choices. Act as a filter. We’ve been trained to believe options are good, but it’s getting hard to navigate a noisy world. 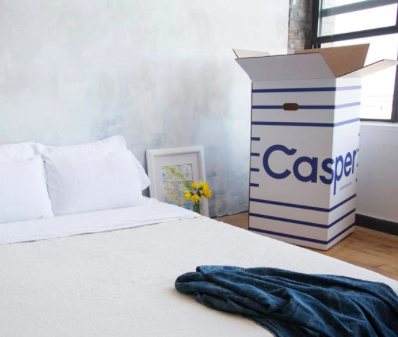 Beyond the limited SKUs, Casper offers a 40-day hassle-free return and Tuft & Needle gives you a 30-night trial. As painful and opaque as the mattress-buying process can be, they’re instilling confidence and overcoming consumer objections. On TuftandNeedle.com, one of the buttons on their main navigation is The Truth. Don’t for a second scoff and brush off this section as some sort of hippie higher-sensibility philanthropist vomiting visions for a better world. I’d bet a solid sum they developed this section in response to data or some kind of reliable intelligence. And they’re supporting an open dialogue by exposing secrets of the mattress industry. 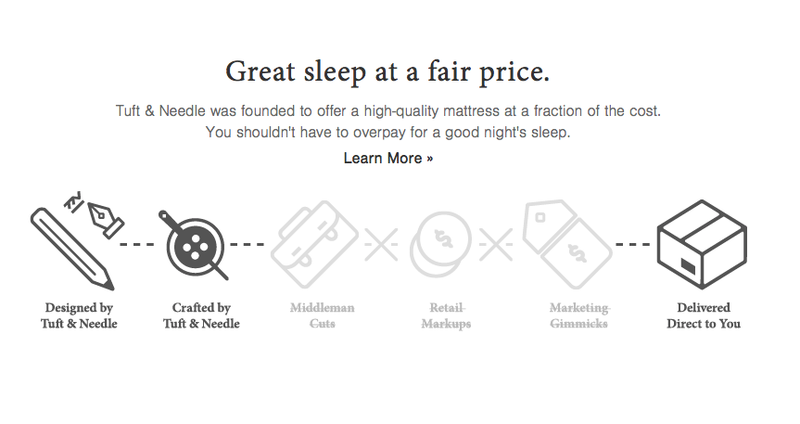 Just look at their mattress markup infographic. You might be saying, all this simplification and transparency is great, but are they selling product? In short, it looks like each company is doing well. On Casper’s blog, the two most recent posts are apologies for delivery delays. After launching April 22, 2014, they unexpectedly burned through their initial inventory. And Tuft & Needle’s mattress is Amazon’s highest-rated bed. Those aren’t hard figures, but all signs point to success. And if this new business model is the bleeding edge, what does that mean for you? For an industry hell-bent on delivering comfort, we often make the shopping process painful and pressure-filled. And my generation doesn’t accept the status quo. If there’s a better way, we’ll find it. My friend Michael Magnuson at GoodBed.com endured a painful shopping experience out of which grew the number one mattress review site on the Internet. Guys like Magnuson, John-Thomas Marino, Daehee Park, and Philip Krim do not care about the way it’s always been done. The great equalizer is at our fingertips and they know how to use it (Internet). That’s reality. Get prepared. Or you might become the ghost. Good thing ghosts only need a couple of choices I guess. Keeping it a little too simple if you ask me, but that opinion is based purely on personal experience, medical and technological research and advancement. I’m pretty sure that that not all of us can sleep on the same system and LOVE it. And I personally can’t wait to get home from any hotel mattresses, because none of them compare to the one I sleep on. That’s probably why I think humans are special and prefer to sell them face to face, without smoke and mirrors, I might add. Good Luck Casper. I applaud these companies for venturing out to disrupt the mattress market. And, I think they are doing a great job based on my assessment. Not sure I completely agree with the other commenter’s point-of-view. 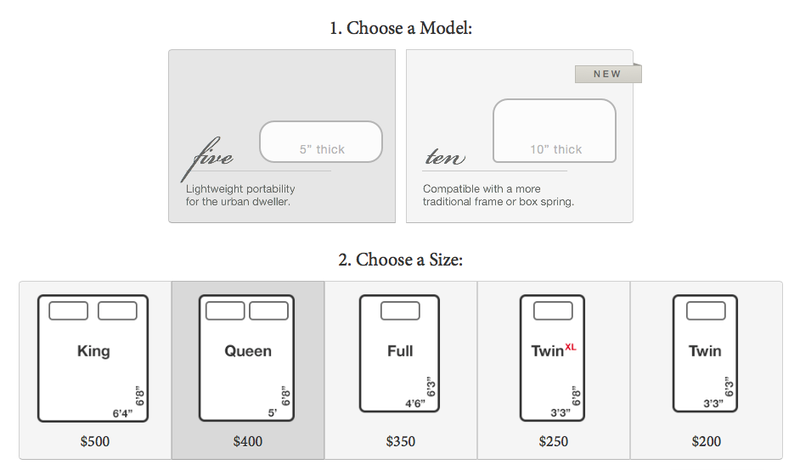 Granted there is no one-size-fits-all, but I think there are too many mattress options which can make the purchase process rather daunting and cumbersome. I can think of fifty thousand other things I would rather do than lie on dozens of different mattresses to find the right one. Mattress prices are ludicrously overinflated, most warranties are a joke, and the salespeople love to upsell you on accessories you don’t need — so there is plenty of smoke and mirrors in face-to-face sales. In full disclosure, I am a happy owner of a 10″ Tuft and Needle mattress and really like it (so does my wife). A few months later, and these guys appear to be growing as predicted. With Casper’s bit raise this summer, no doubt that a slew of new similar competitors will follow shortly. I’m very interested to see how companies continue to implement the DTC model and what types of products will be produced in this space. Just as you predicated, Kenny…many other mattress start ups are on the rise. Just this past fall Leesa mattress launched. It wouldn’t surprise me if 2-4 new start ups launch in 2015. It’s fortunate apparitions just need two or three decisions I presume. Keeping it excessively straightforward in the event that you ask me, however that feeling is construct absolutely with respect to individual experience, therapeutic and innovative research and headway. I’m almost certain that that not every one of us can think about a similar framework and LOVE it. What’s more, I for one can hardly wait to return home from any hotel mattresses , since none of them contrast with the one I think about. That is presumably why I think people are extraordinary and like to offer them up close and personal, without smoke and mirrors, I may include. Good Luck Casper.